Hi I flashed my 9x with opentx 2.2 after that if I turn on the transmitter nothing happens. If I now try to read I get a communication error what do I wrong? Somebody here how can help me? Please provide the exact error. You don't have the 9x powered on. This programmer requires the target (the 9X) to be powered. Your 9X is a so-called "V1". See the "My 9X is a V1 (or V2 or V3)?" in the pre-sales section above. Unfortunately, there's no simple way to test for a defect other than ruling out the other possibilities, so go over everything three times then please contact us for further assistance. Generally very good advice. NEVER use the -F option! However, in this case, it can't cause a problem because a connection to the target doesn't exist It can't solve the issue either, so NEVER USE IT! It could have caused a problem if he used it when flashed the radio the first time. Remember he said that after flashing it went blank and never responded again..
A bricked radio will display the same error. Not saying it is the case here though..
What settings do you have in companion? Exactly what file did you flash? What chip does your radio have? Matzeeg3, did you go through the troubleshooting items I posted? My guess is you didn't have the radio on. Flashing an unpowered target can erase it, but not program it. i attached a picture with the settings of my companion. Yes i did the troubleshooting but nothing change. I have the transmiter powered on as you can see on my picture bevor. do i have to by a new mainboard? i just check the vcc power if i power on the transmiter i get +5v on the vcc. Well, I only see a picture of Avrdude's output,not one of the configuration settings.. Please try adding -B 100 to the extra arguments field. 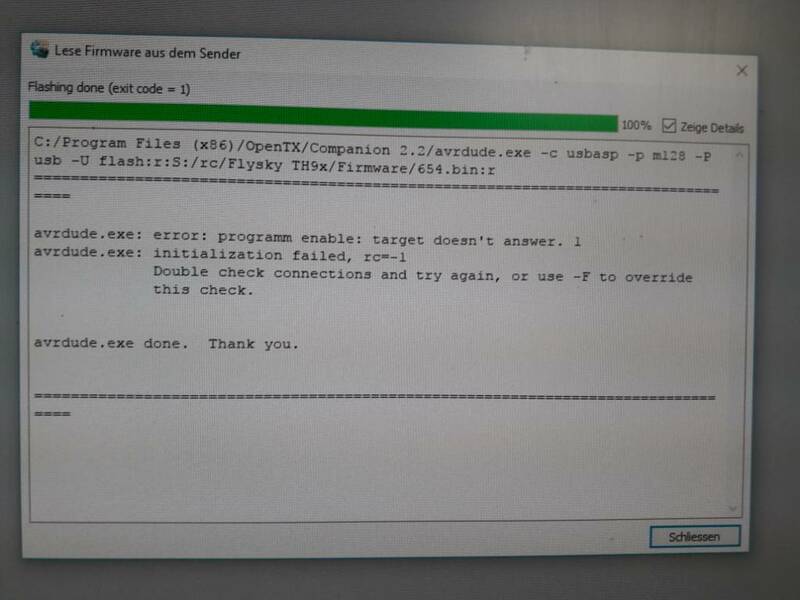 Try doing a reading of the eeprom or firmware instead of trying to flash the radio..
i did what you told see attached images. It looks like you might have some connection problem. Could you please post a picture of your 9x mother board. Also check that no pogo pins are bent on the smartieparts board, or that their springs are locked and not making contact. so am i right that i destroy my mainboard? is there a way to buy only a new processor or do i have to buy a new mainboard? Some info here about new processor if needed: (viewtopic.php?f=95&t=3819&p=74105#p74046). Do you know that your processor is bad ? no i don´t know if my processor is bad. but i don´t get any connection. Would be better to upgrade to the Atmel - ATMEGA2561-16AU chip: (viewtopic.php?f=95&t=3819&p=71554#p71554). The problem may be somewhere different, we are not sure you have a bad chip. please post a good picture of your 9x mainboard.. I have no idea if openTX supports the m2561. This chip does allow for more features. But I believe openTX is not being developed or maintained for the 9x stock board anymore. Er9x is. It doesn't even support some features like the multi protocol module.. I personally think that you would be better off with er9x..
if we are on this step can you tell me in a short the diference between opentx and er9x? The major differences I already told you. Er9x is still maintained, so you have more chances of having new features, or support for more hardware implemented. Er9x supports the 4 in 1 Multiprotocol module. Er9x supports the addition of extra hardware like extra switches. In my opinion er9x has a much better user interface and it is much easier to navigate the menus and find the options we need without having to scroll through many menus before you find the one you want. But this one is my opinion of course. so i decided to the 128-16AU because i can use it with the er9x and opentx. now the complicated part the soldering. have to finde time for it. A good pair of eyes, a good magnifier, good soldering iron with a fine tip, good solder, lots of flux and lots of patience..
jhsa wrote: A good pair of eyes, a good magnifier, good soldering iron with a fine tip, good solder, lots of flux and lots of patience..
Getting some "CHIP QUIK" will help a lot too.